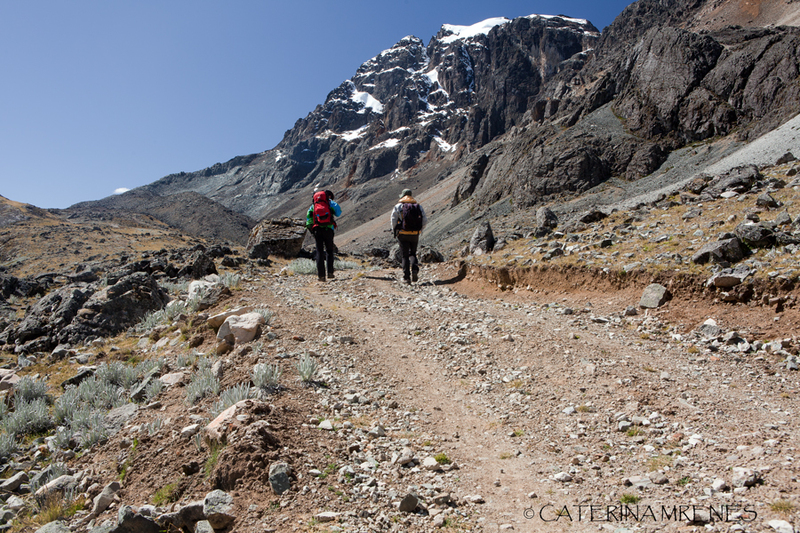 After four acclimatisation hikes we started on May 22nd towards Cordillera Huayhuash. The road till there takes between 3,5 and 5h, it depends. On the way there the guide might stop the car to show you one place or another, so you are likely to be on the road for some 5h. On the way back you are so overwhelmed by what you have seen in Huayhuash that nothing can impress you anymore so you just sit silent in the car. You can see the best pics from Huayhuash in the gallery, however here comes the story. 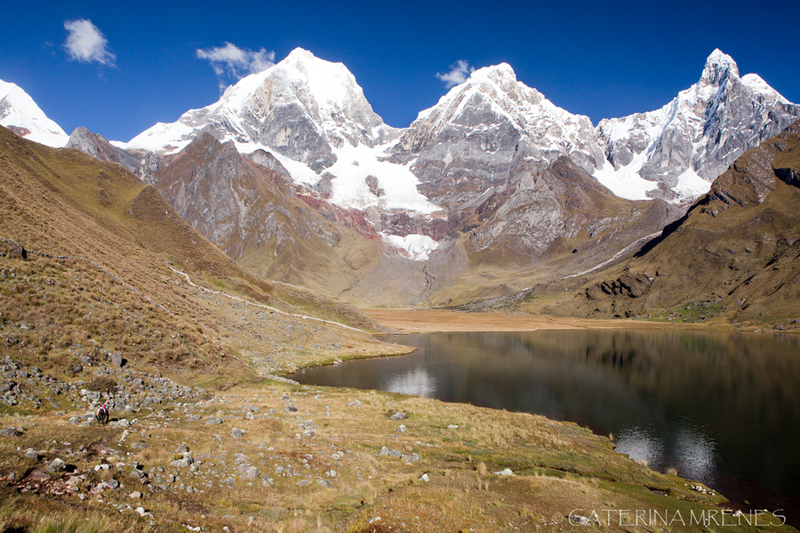 Cordillera Huayhuash is a smaller mountain range stretching over approx. 30 km. It comprises several peaks over 5.000m but the most extraordinary ones are Nev. Jirishanca (6.094m), Yerupaja Chico (6.089m) and Yerupaja Grande (6.617m), Siula Grande (6.344m) and Sarapo (6.127m). 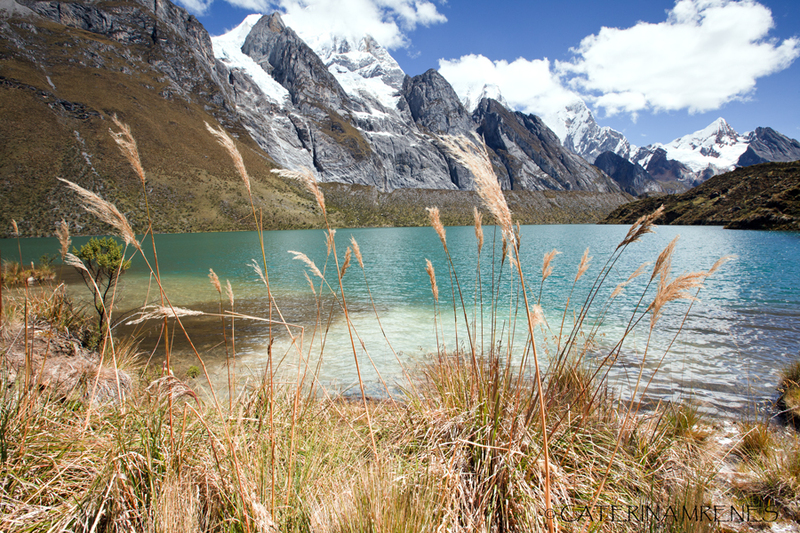 Circumnavigating the main ridge of Huayhuash is what the Classic Huayhuash Trek is about. 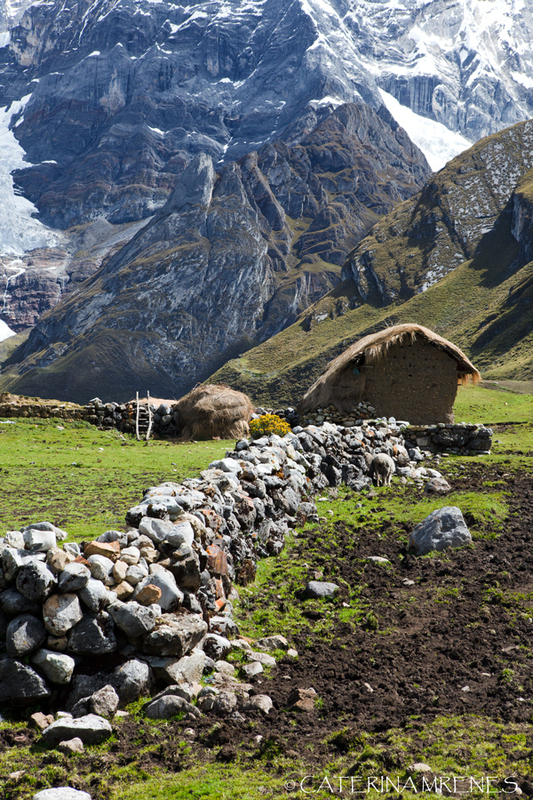 It covers 120km and takes between 10 to 12 days (it depends, if you want to take a day off – which is highly recommendable – and/or want to visit the base camp of Siula Grande, scenery of the dramatic book “Touching The Void”). Each day you will walk 8-15km, each day you will cross a pass. The highest points are Pass Cuyoc and Pass San Antonio (both have ca. 5.000m), the lowest is the village Huayllapa (3.600m). 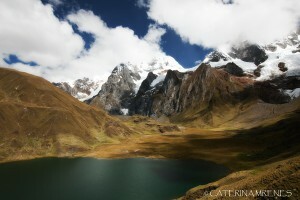 Today the Huayhuash Trek starts at the Camp Quartelwain. 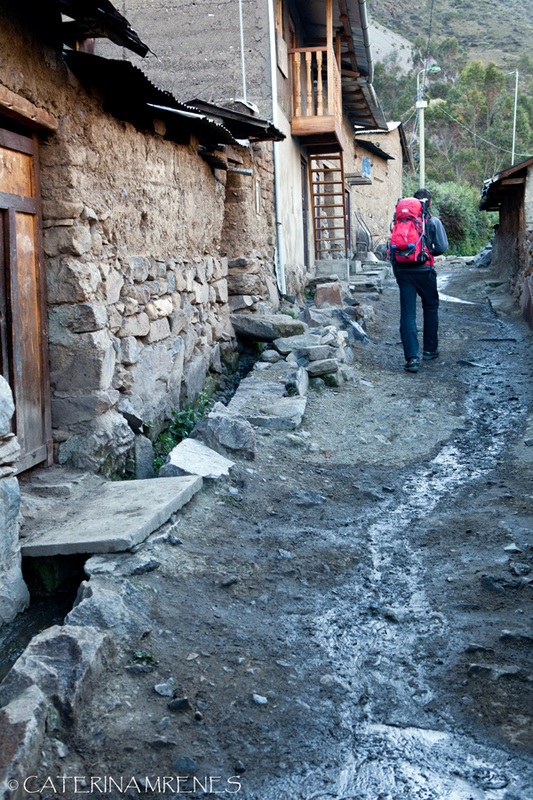 In the past however – and for the purists maybe even today – the trek started already in the village of Llamac, where the dirt road ended. At some point the dirt road was extended so the cars can drive these days till Quartelwain. The stretch between Llamac and Quartelwain is not really interesting, so you don’t miss anything in driving straight to the camp. Below is a picture of the village Pocpa (taken with the 70m-200mm through the closed window of the car), which is situated between Llamac and Quartelwain. 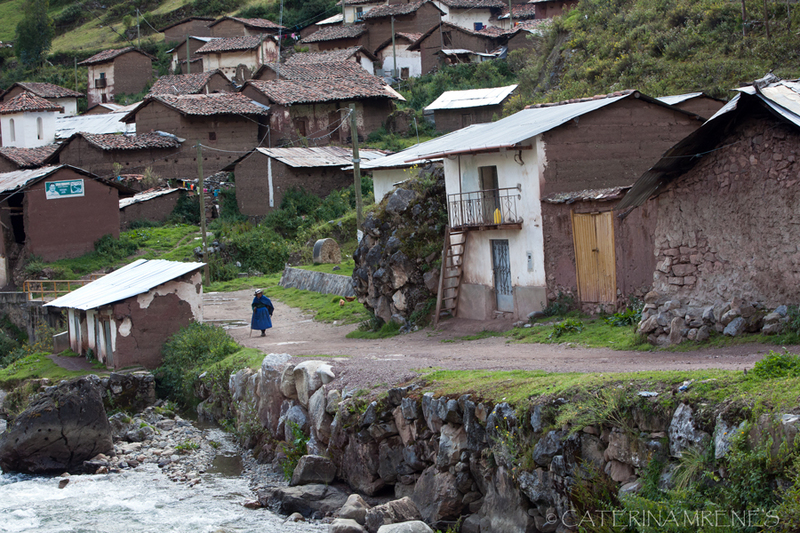 It was my first encounter with a really isolated andean village. From Camp Quartelwain (4.170m) we started next morning to the first Pass: Cacananpunta (4.690m). 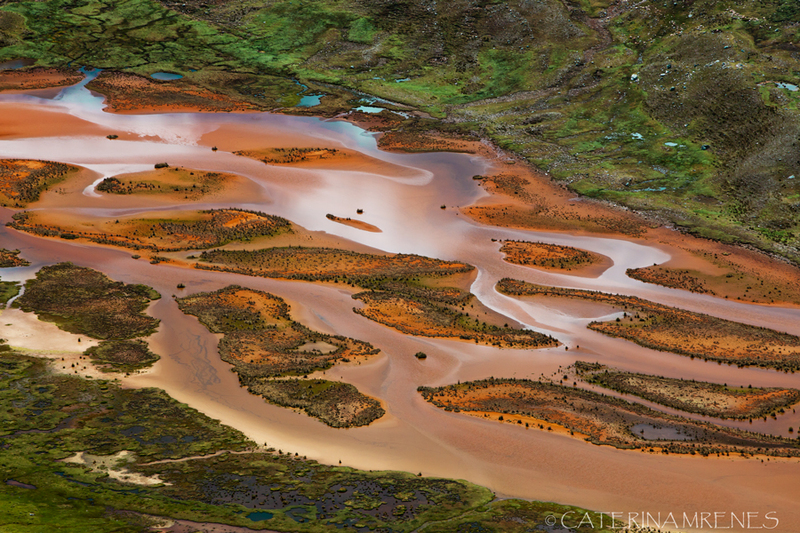 From there you see these waters below, which according to the map are thermal waters. The reddish colour is due to the iron content. During the descent from Cacananpunta I had again a strong headache and was waiting in mild desperation for the painkiller to finally work, when we took a sharp turn right and were suddenly struck by the view of the first high peaks, covered in snow. The view from the second camp (approx. 4.300), placed on the shore of Rio Janca, was beautiful beyond description. Ignoring the persisting headache, Matthias and I set the tent and took a walk across Rio Janca towards Lake Mitucocha, some 40 Min. from the camp. Rio Janca doesn’t look big. It is barely 1,50m wide, mostly narrower, but unexpectedly deep. I could have easily drown myself in its dark, silent flowing waters. 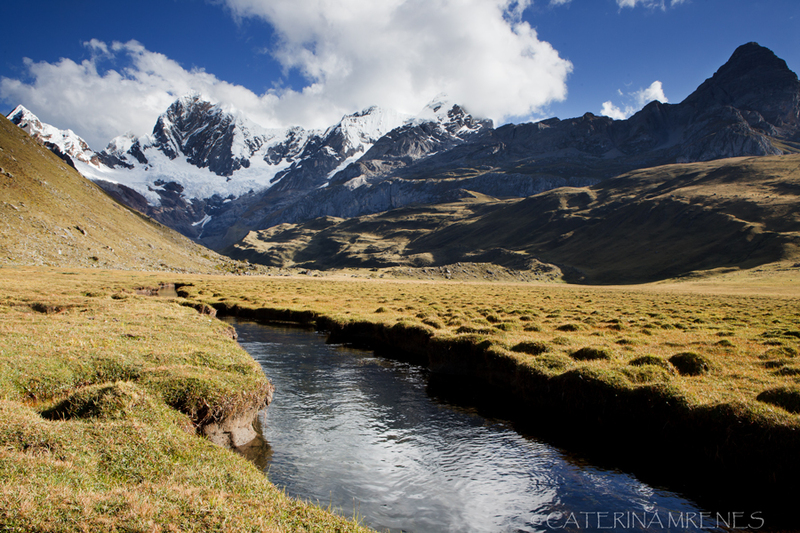 I was soon to be impressed by the unusual abundance of water in Cordillera Huayhuash. Two rivers can flow next to each other, sometimes even in the same direction and along two different altitude terraces. It breaks ones heart to know that none of it comes from underground aquifers, but from melting glaciers. The whole fertility of the Andes, the drinking water of whole Peru and 80% of its electricity come from rivers, formed by melting glaciers. And they melt at an extreme fast rate, facing Peru and its authorities with a critical problem: from where to get water when the glaciers will disappear? Plans to desalinize ocean waters are already discussed. 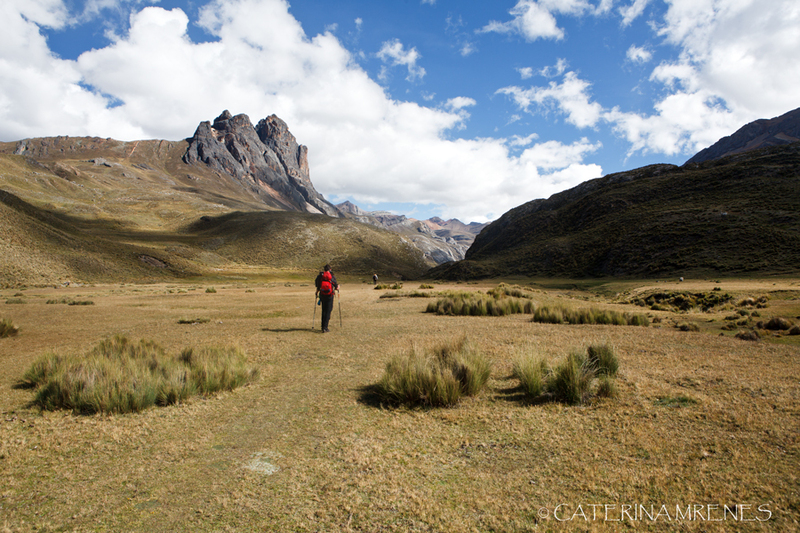 On the third day we left the beautiful camp at Rio Janca and headed towards the Pass Carhuac (Yanapunta) – 4.630m. 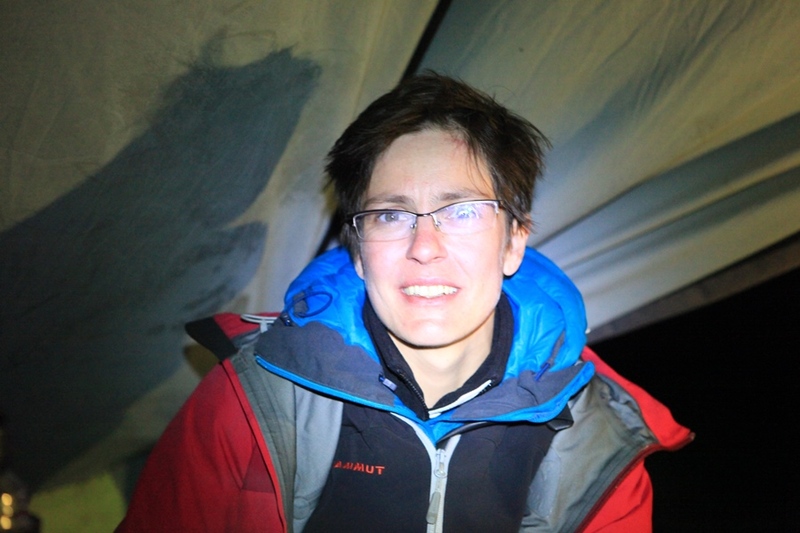 By now we had already got used to the daily routine: wake up at around 6.00 AM, emerge fully dressed from the tent, pack the whole stuff, then wash hands, teeth and face, eat breakfast (mostly omelet – I have eaten in Peru more omelets then in two years put together in Germany), pack the tent and then start toward the next camp. 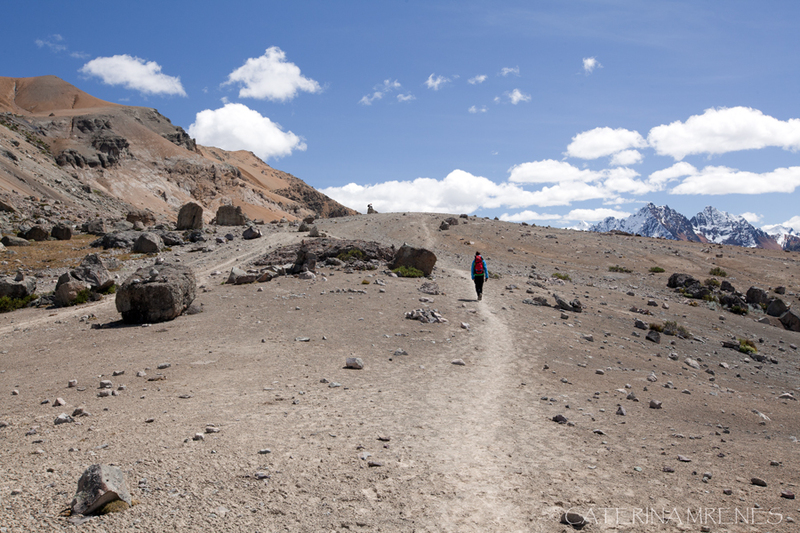 We were heading now towards Laguna Carhuacocha (4.138m) – one of the highlights of the trek. 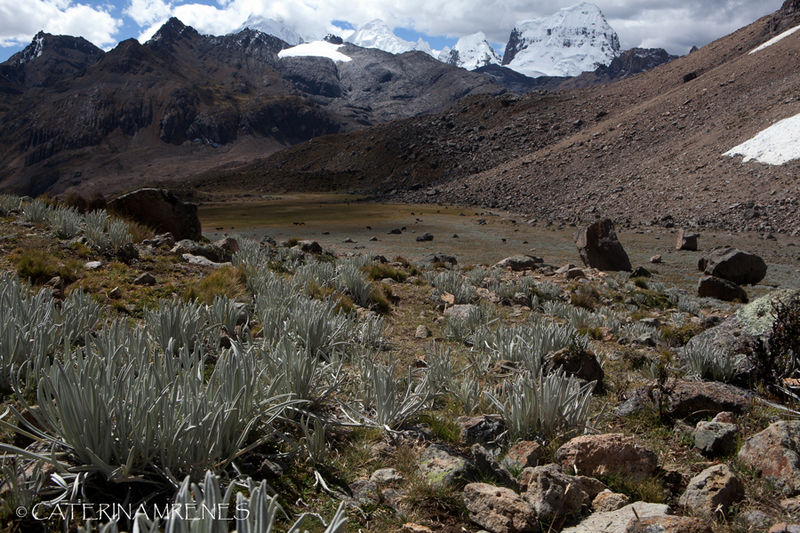 Again, after a long descent among grassy hills, we took a sharp turn right and were totally speechless upon seeing for the first time the famous peaks of Huayhuash: Jirishanca, Yerupaja and Siula towering next to each at the east end of the huge Laguna Carhuacocha. They are all extremely difficult to climb, not many mountaineers try their luck there, and from whatever reason not even the professional mountaineers come here much. 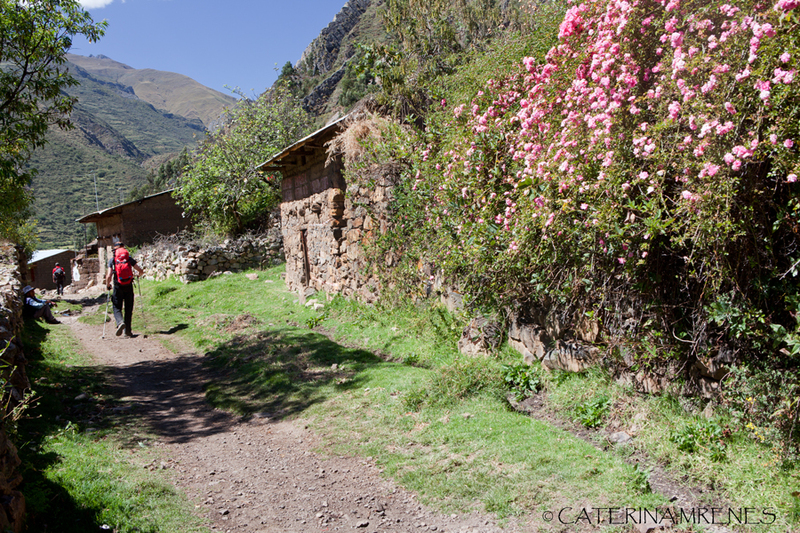 Walking down to the camp from Laguna Carhuacocha we passed over several ancient looking huts, which look so ancient that you almost cannot believe they are actually real and in use. For a second the question popped into my mind as to why the people living here built stone walls – that is really tiresome and takes an eternity to finish, but then it occurred to me, that there is no wood there, no wood at all, so stone, clay and straw are the only construction materials available. I appreciated very much Nestor’s idea who told Guzman and Pablo, who always reached the next camp much faster than we did, to set the camp right on the lake shore. There are two marked camps at Carhuacocha, one above the lake, the other one in a corner at the west end of the lake. Both were cramped with trekkers that day, and the upper one is really a narrow spot. Setting the camp where Nestor said, meant that we enjoyed alone an unique view of the lake. The fourth day was one of the most strenuous but also the most spectacular. Walking towards the next pass, we went round the lake…. … passed again along potato fields and ancient looking huts. The people living here have no access to any kind of infrastructure. There is no doctor and there is no school. Until 30-40 years ago, settling here didn’t involve buying land. One simply made a stone enclosure and said: „this is my land“. No purchase agreement, no money, nothing of the sort, was needed. 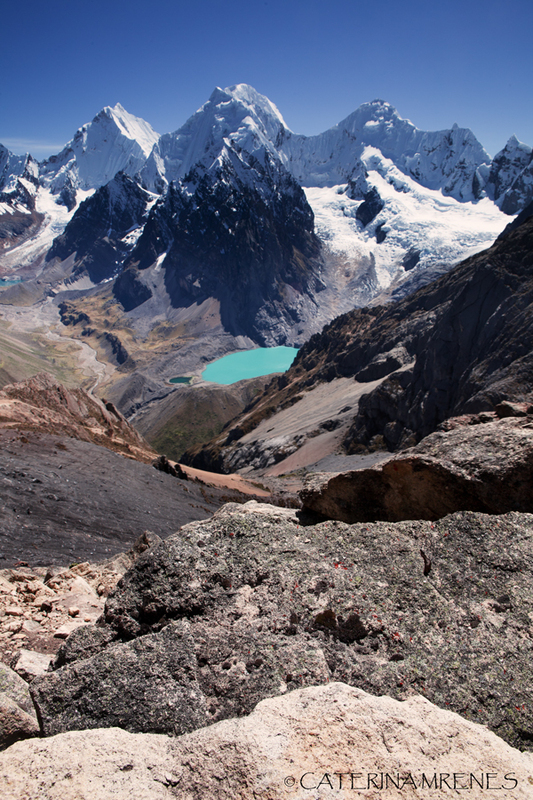 …and reached after a while the second from the three lakes – Gangrajanca, Siula and Quesillococha – which are one of the best known Huayhuash motivs (Gangrajanca can however be seen only from the view point). Going up to the view point was however all but easy – the way till there was one of the steepest parts of the whole trek and I wonder if I would have really managed it if Matthias wouldn’t have taken a part of the photo gear and Nestor the whole rucksack. However from the view point there is still some way to go till the Pass Siula Punta (4830m) and after the pass comes a pretty long descent till the fourth camp (Huayhuash Camp, 4.350m). The next day brought an encounter with what I first thought were stones covered in moss. Well, they were not stones, but I don’t know what they were. They were soft but nevertheless hard and stable enough to hold a big weight. They reminded me somehow of the stromatoliths from Australia, but they were not stromatoliths. The water they were floating in was very deep – again, I think in some places I could have easily drown. I don’t have any photos from the fifth camp (4.365m) where the hot springs are located, though this is another highlight of Huayhuash. Not because the landscape is particularly beautiful here, but because of the hot springs themselves. The water in the three basins has different temperatures, the middle one is the hottest and the smallest one is for washing. Most people can bear the temperature in the middle basin for max. 10 minutes, but for me it was just perfect. Once I jumped in it I didn’t come out anymore for over one hour. The next day brought the ascent to the highest pass so far: Pass Cuyoc (4.950m according to the map, 5.060m according to the GPS.) Again, that was a day I walked badly while Matthias sprinted the last 50m to the pass as if he was jogging in the forest next to our house in Stuttgart (400 m.a.s.l.). Climbing down on the other side of the pass (very abruptly), we caught a last sight of Mount Trapecio which we have seen from its other side two days ago at Camp Huayhuash. 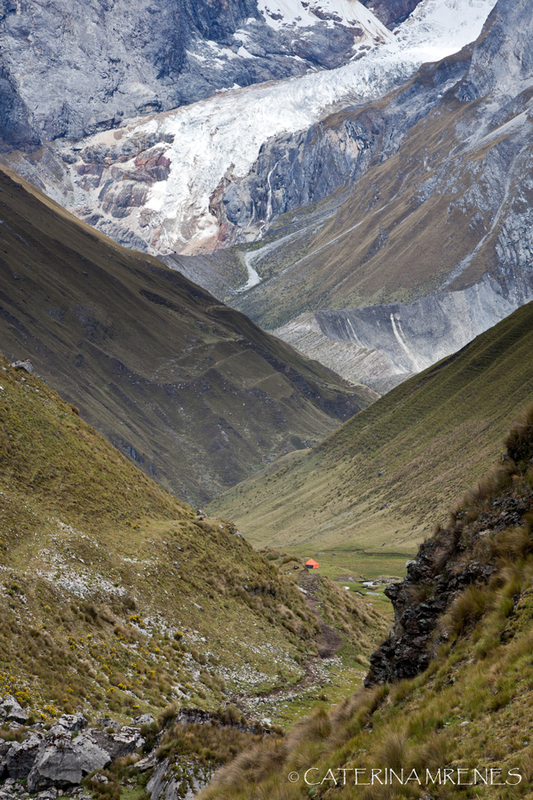 Descent to Camp Cuyoc with Mount Trapecio in the background. 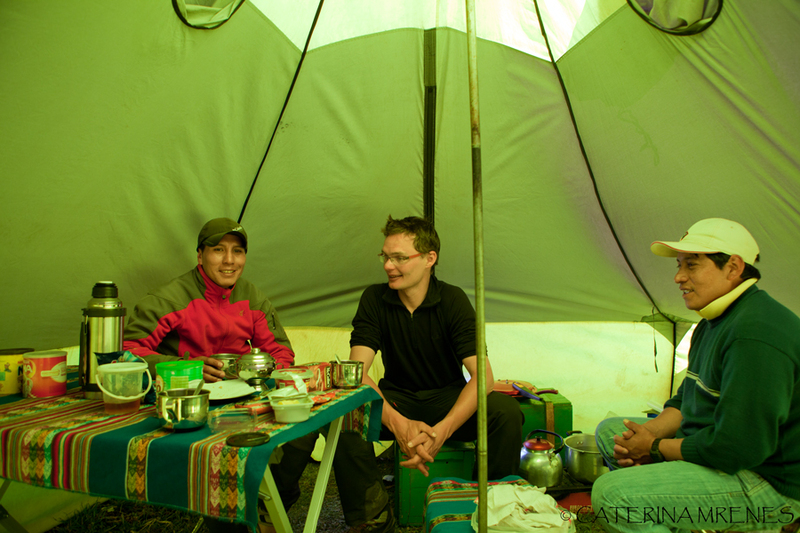 We reached the sixth camp (Camp Cuyoc 4.492m) this time early enough to rest a bit in the tent, and drink tea and eat biscuits in the common tent with Pablo, Guzman and Nestor. Here it was that I also made my first try with star trails. Not bad for the first time ever! The white balanced got completely wrong – I don’t know why. One more day and one more pass (by now we felt already sad at the thought that the end of the trek was getting nearer): Pass San Antonio 5020m. The way there is short and very steep. The descent from the pass is even steeper and extremely long. Practically nobody comes to San Antonio from the other side. What compensates the difficulty and length of the descent are the blue lupins, covering the whole mountain side, as far as the eye can see. And it keeps like this through the entire valley on the way to the next camp in the Village Huayllapa. 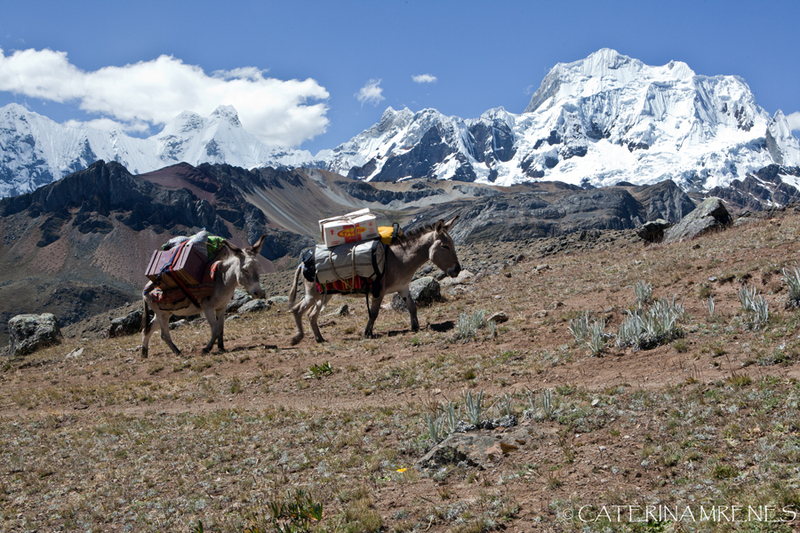 The descent from San Antonio Pass takes some 13 km and together with the last descent of the Huayhuash Circuit, from Laguna Jahuacocha to Llamac, where the trek ends, they are the longest of the entire trip. 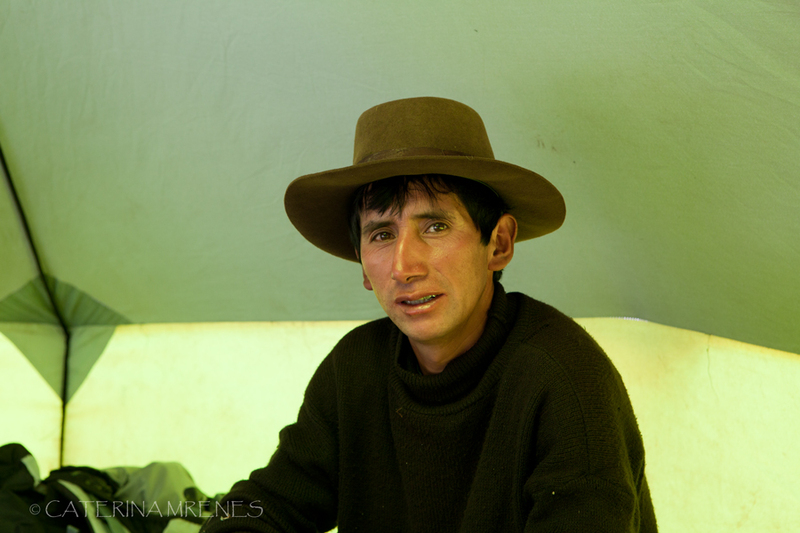 After seeing each day such extraordinary landscapes, the camp in the middle of the Huayllapa Village (3.600m) is not exactly the cracker. Particularly since it was in the middle of a miniature football stadion. Even more since we were woken up at five o’clock by the sport class. So we didn’t have any regrets leaving the village early in the morning, though upon hearing how far and high the next pass is, I asked myself if I would be really capable of going up there. For me this stretch was maybe the most difficult, and I made big efforts to empty my mind in order not to think at the huge discomfort every step brought with. I simply counted the steps 1-2-3-4, sticking the walking sticks in the ground on the bits 1 and 3 and concentrating only on maintaining this pattern. 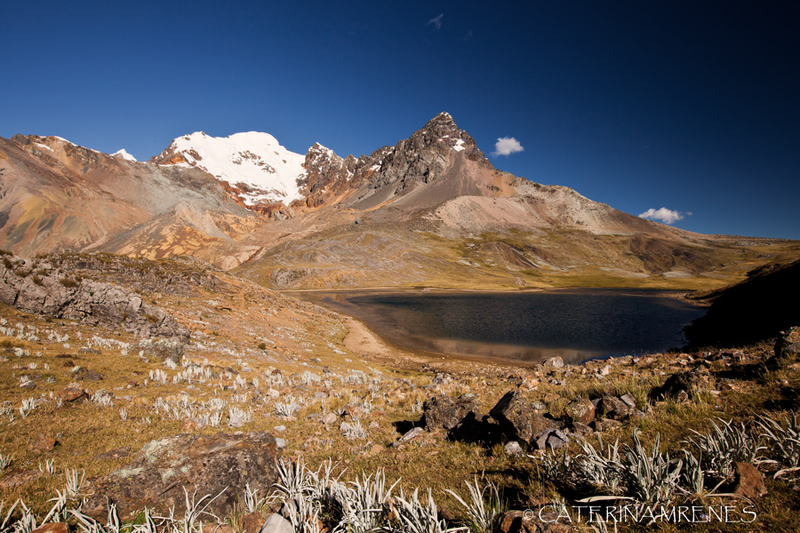 Shortly after the pass we came across Laguna Susucocha (4.470m) from where we saw Diablo Mudo (5.350m). From the nearby camp many trekkers go on top of Diablo Mudo which is a quite easy climbing tour (I mean easy compared to the difficulty standards of high mountains). 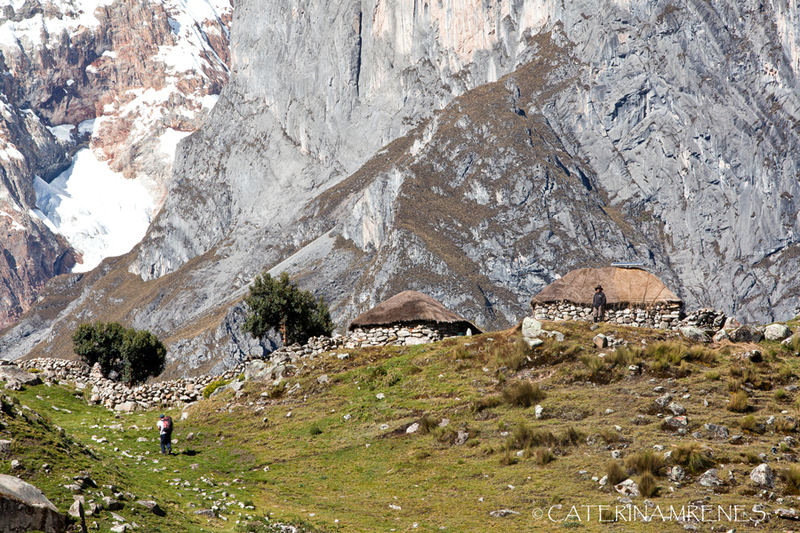 Since we had other plans in Cordillera Blanca (which however we couldn’t fulfill completely) we didn’t consider going up there, but no we regret a bit not have doing it – from the top one has a fantastic view to Yerupaja. 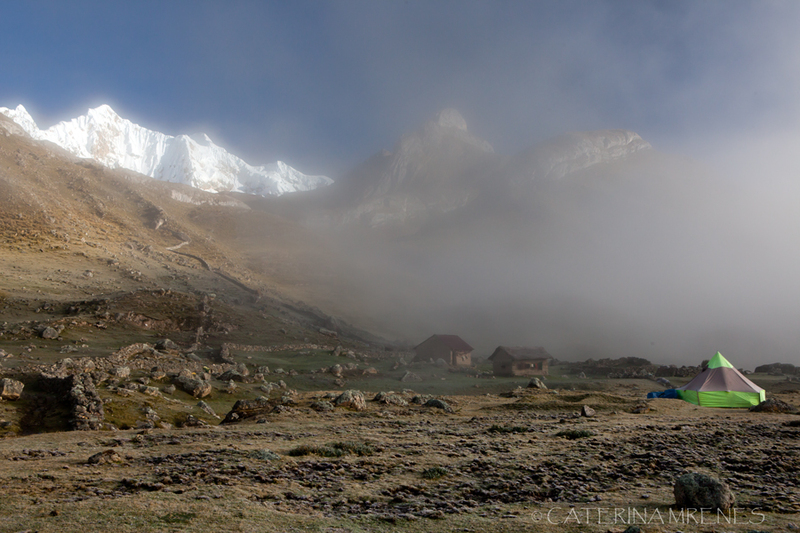 From the camp Gashpampa (4.300m) we started next day to the last pass: Llaucha Punta (4850m). 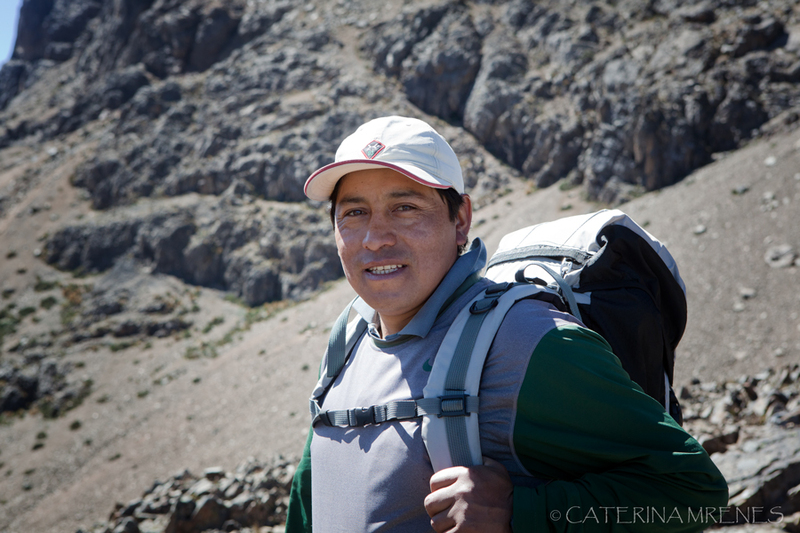 It was the first time we reached the pass at the same time with Pablo, who always left the camp together with Guzman after us and always reached the next camp before us. I each time asked myself: How on earth can he walk so fast, and I think he also asked himself each time he outpaced us: How on earth can they walk so slowly? Right after we left Llaucha Punta behind us we had for the last time complete view over Jirishanca, Yerupaja and Siula Grande – which we hadn’t seen anymore after leaving Laguna Carhuacocha at the start of the fourth day. It was their western side that we saw from Llaucha Punta, at Carhuacocha we saw the eastern one. 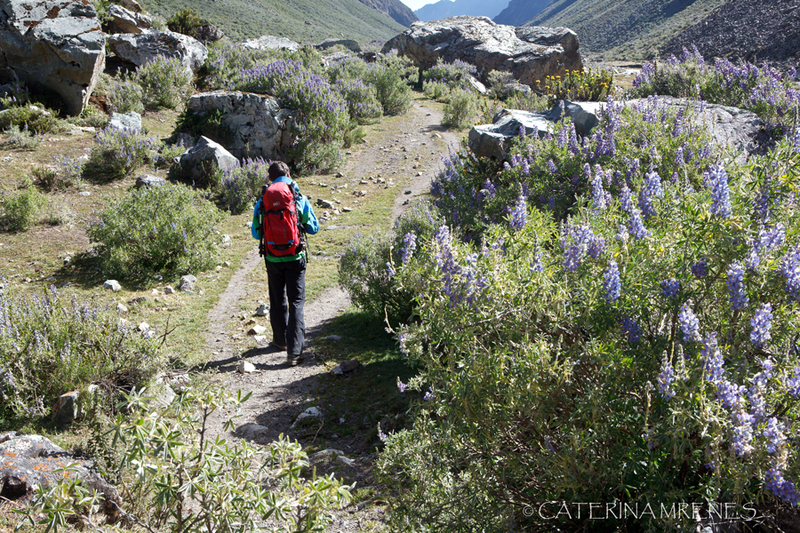 Our last camp of the trek was at Laguna Jahuacocha (4.050m), at this time of the year even more impressive due to the blue lupins (see gallery). Expect here also to step all the time in cow pies, it was almost impossible to place the tripod in such a way so that it doesn’t stick in one. There are really a lot of cows there, and they are so scattered that I wondered who milked them and what did the peasants do with the whole milk? It was the only question I had to which Nestor couldn’t find a satisfactory answer. On the last day we cheated and skipped the last pass (Macrash Punta) and took instead a flat road following the water pipe. The motivation to go up again was by now very low. Even without the pass the road back to Llamac was so long, and the descent in the last part so unpleasant and abrupt that we were more than happy to sit in the car, with the perspective of a long shower and a real bed in Huaraz. In Llamac we said good-bye to Guzman, who lived there, had a good warm meal in the house of Christian’s mother, who also lived there, and headed then to Huaraz, where we spent again two days at Hisao’s Guesthouse, before heading to Cordillera Blanca. 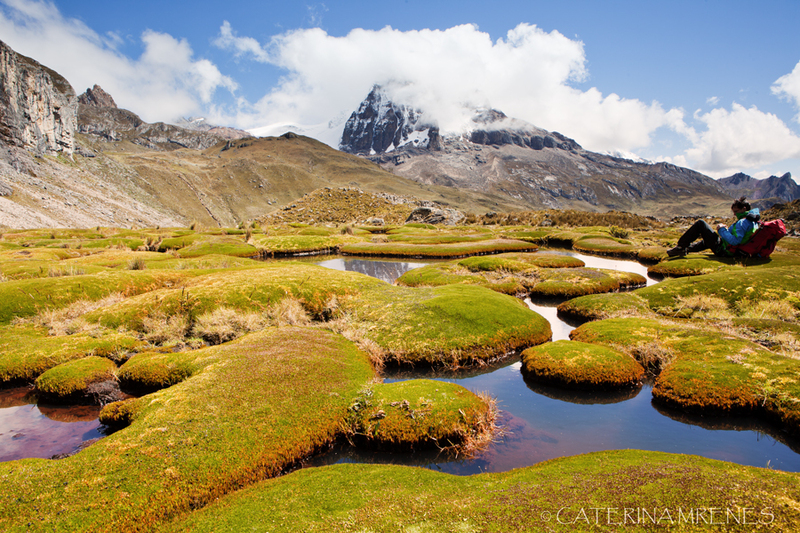 This entry was posted in Cordillera Huayhuash, Peru and tagged Andes, Classic Huayhuash Trek, Cordilera Huayhuash, Peru.